A sensational last quarter saw the Cats pinch victory from the Tigers by 4 points.The Cats kicked 6.9 (45) to 1.0(6) in the last quarter in a tidal wave of possessions and field position. 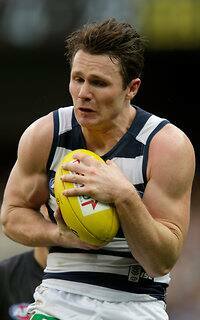 Dangerfield a match winner with nine last quarter disposals. And remarkably now the Cats take a nine point lead through the Hawkins goal, which followed on from the Taylor goal that put them in front. Taylor kicked his first goal of the season in his 200th career match. Geelong in full control this quarter, now with 4.8 (32) to no score. The Motlop goal came from another mark inside 50 for the Cats, their fifth this quarter. The Cats have had 77 disposals to 43 this quarter. With the Cats attacking hard in the last quarter Rance has been under siege. He has executed six spoils already this quarter, for a match high tally of 17, which also a team season high. Geelong with the only six scores of the quarter so far but in a continuation of its inaccuracy have only kicked two goals. Richmond has only gone inside 50 twice this quarter so far. A strong contested mark to McCarthy who then goes back and kicks his second goal of the day to become Geelong's first multiple goal kicker. The Cats lead the contested mark count across the match 188. Geelong controlling the first five minutes of the last quarter, leading the disposal count 149 and inside 50s 4-0. It takes the Cats just three disposals, and 20 seconds, to kick the first goal of the last quarter through Caddy. Caddy has seventeen disposals for the match, including eight contested possessions and two clearances. Another great quarter by the Tigers see them extend their lead out to 35 points at the last break. In a free flowing quarter where neither side laid more than ten tackles, it was a much more efficient Richmond who took the most of its chances. Enright takes his fourth intercept mark of the day, a match high, deep in defensive 50 for the Cats. the Cats leading the intercept mark count 154. A Duncan turnover on defensive 50 for the Cats allows Richmond to send the football deep into attack resulting in Grigg's first goal of the day. Five of the Tigers' 11 goals today have originated from Cats' turnovers. Only eight tackles laid so far this quarter across both teams, with the Tigers leading the count 53. Drummond of Richmond leads the count across all players for the match with seven; an early career high for him. Cats InterchangeJosh Cowan off due to the blood rule. A 50 metre penalty against the Tigers' Ellis send McCarthy inside forward 50 to kick the Cats' first goal of the second half. McCarthy with nine disposals and three score involvements so far today. The Cats yet to score a goal this quarter from 12 inside 50s, with only five behinds to their name. The Cats disposal efficiency across the entire ground today in 79 per cent, but drops to 61 per cent inside their forward 50. The Tigers win their first clearance of the quarter at half back and are able to transition the football all the way to inside forward 50, resulting in Lloyd's second goal of the quarter. The Cats lead the clearance count this quarter 41. The Tigers continue their efficiency when going forward kicking their first goal of the half from their first inside 50. the Tigers now have eight goals from 18 inside 50s. The Cats have almost double this with 35 inside 50s. The Cats with the first centre clearance of the half, the first inside 50, and the first score; a behind to Scott Selwood. The Cats lead the centre clearance count for the match 83. Despite losing the inside 50 count that quarter 720, the Tigers kicked five goals to one to take a 21 point lead at the main break. Martin continued to be busy for the Tigers and leads all players with 20 disposals. After trailing in the tackle count early in the quarter 17, the Tigers lifted to now lead the count 16-12. Scott Selwood working hard to stem the flow for the Cats this quarter leading all players with ten disposals, including two clearances and three inside 50s. Joel Selwood with the Cats' first goal of the quarter, from the first mark inside 50 from either side for the quarter. Despite the scoreline, the Cats lead the marks inside 50 count 51 across the match. The Hampson goal was the fourth for the Tigers from four inside 50s this quarter. The Cats are yet to score a goal from 12 inside 50s this quarter. Edwards roves the ruck contest right on the 50 metre arc and earns the clearance as he kicks his first goal of the match. The Tigers now with the last four goals of the match. Lloyd with the first goal of the quarter from the Tigers' first inside 50 of the quarter. That inside 50 broke a run of seven consecutive inside 50s to the Cats this quarter, and a run of ten across both quarters. Five minutes in to the second quarter and the Tigers are yet to go inside forward 50. The Cats are exerting a high level of pressure on the Tigers so far this quarter, also leading the tackle count 71. An even first quarter sees the Tigers take a slender two point lead into the first break. Martin was busy with a quarter high 12 disposals for Richmond, Ellis and Houli also in double figures while Joel Selwood lead the tally for the Cats with nine. Tigers InterchangeShaun Hampson off due to the blood rule. Cats InterchangeScott Selwood off due to the blood rule. After conceding the first three clearances of the match, the Cats have evened up the count at five apiece. Miles of Richmond the only players with multiples clearances to his name with two. 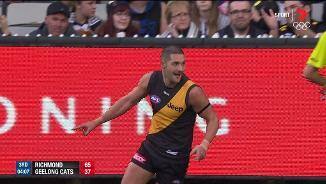 Markov with the goal assist as he spots Rioli on his own inside attacking 50 for the Tigers. That was the Tigers' first mark inside forward 50 for the match, while the Cats have taken three. The Cats have controlled field position so far in this match leading the inside 50 count 95. Cowan and Dangerfield with two inside 50s each. 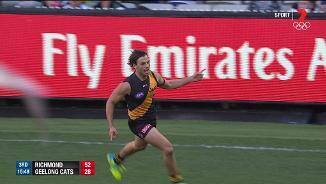 Martin involved in the chain of possessions that results in the Vickery goal for Richmond. Martin leading all players early with seven disposals, but only going at 57 per cent efficiency. A Jayden Short turnover at half forward for the Tigers gives possession to the Cats who transition the football all the way to inside forward 50, resulting with a strong contested mark to Zac Smith, who then kicks truly for the first of the match. 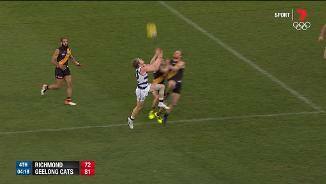 Richmond with the first two clearances of the match, one each to the Cotchin and Grimes. 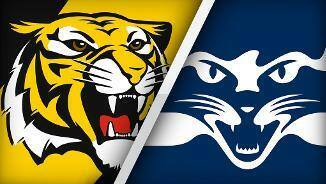 A important game for the fifth placed Cats' finals hopes as they take on the thirteenth placed Tigers. Richmond has lost 18 of its past 19 matches against Geelong since 2001, its past two defeats have been by single digits. Welcome to MCG for the Richmond v Geelong Cats Round 21 clash. GEELONG has stormed home with six goals to one in the final quarter to defeat an unlucky Richmond by four points in a thriller at the MCG on Sunday. 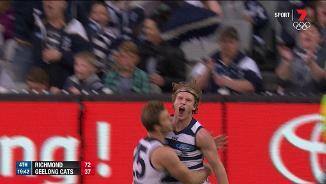 The Houdini-like escape keeps the Cats’ top-four aspirations on track and sets it up for a premiership tilt. After kicking just four goals in the first three quarters, despite dominating the inside 50s, the Cats came alight in the final quarter, playing on at all costs and turning the game on its head. Geelong kicked an extraordinary 10.22 (82) to Richmond's 12.6 (78) and is now a game clear inside the top four. Lincoln McCarthy was inspiring, clean and full of running while Patrick Dangerfield began winning vital centre clearances. 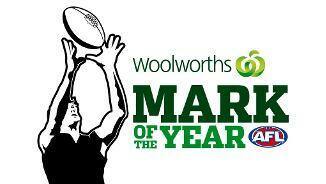 Geelong ended the game with its noses just in front despite winning the inside 50 count 66-39. Harry Taylor, in his 200th game, put Geelong in front with five minutes remaining after receiving a free kick in front of goal. Tom Hawkins then kicked his first goal to give Geelong some breathing space. The Cats hung on with Richmond deep in attack after Tyrone Vickery kicked a goal for the Tigers with just 21 seconds remaining. 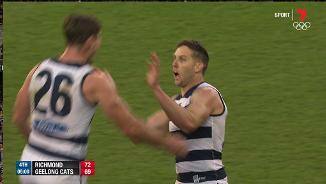 Scott Selwood played well for Geelong and won a vital one-on-one against Jack Riewoldt late in the game that led to a Steven Motlop goal and kept the Cats' hopes alive. It was a magnificent fightback as the Cats kicked just two goals to Richmond's nine in the second and third quarter. 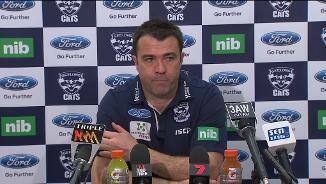 Geelong coach Chris Scott said the Tigers forced them to work hard. 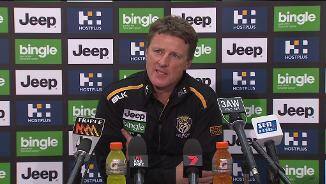 "Richmond played a different style to the one that have played for most of this year and it made it hard for us," Scott said. "We were playing, in a really high stakes game for us, some of our worst footy for the first three quarters so we needed to change some things around. "I think we were always confident that once we got some momentum the game could shift." During that stage of the game Geelong’s ball movement was slow and it could not take advantage of the inside 50s. The Tigers opened up the game in the second quarter, kicking five goals to one, despite having just seven inside 50s in the term to Geelong's 20. It was a trend that continued through the third quarter with Richmond having 11 goals at three-quarter time to the Cats’ four, despite trailing the inside 50 count 31-47. Geelong played like a bottom-four team rather than a premiership aspirant at times, fumbling, slipping over, dropping marks and appearing less desperate than the Tigers. Richmond was able to slow Geelong's ball movement and then score on the counter-attack, frustrating the Cats, who looked predictable. At half-time nine defenders were inside Richmond's top 11 players for disposals, with Alex Rance dominating Hawkins. At three-quarter time Geelong coach Chris Scott threw Lachie Henderson forward to join Taylor and the Cats attacked the game. He must have also prayed for a Kyle Chalmers-like comeback. Richmond was brave but could not hold on with Dusty Martin, Trent Cotchin and Rance close to the best three players on the ground. 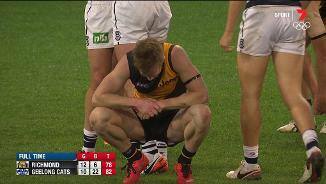 Tigers coach Damien Hardwick was magnanimous in defeat despite his disappointment. "You look at [Patrick] Dangerfield and [Joel] Selwood's influence, they just rose to the occasion and there's a reason they're a top-four side," Hardwick said. 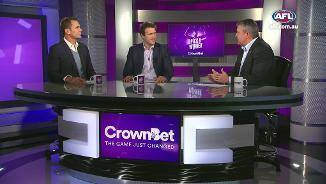 "When you have 19 inside 50s you're battling against the dam wall. We just couldn't win any ball across half-forward. We're disappointed but at the end of the day the better side won." 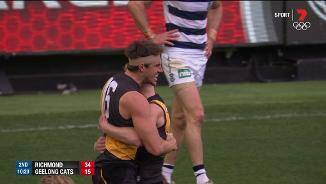 Richmond: The Tigers got through the game unscathed although ruckman Shaun Hampson appeared to be labouring at times with a leg injury and received a cut to the head. Geelong: Harry Taylor received a hip pointer injury after being crunched in a marking contest but should be fine. Scott Selwood and Josh Cowan both received cuts to the head but were fine. The Cats should welcome back Andrew Mackie, Daniel Menzel and Nakia Cockatoo. Geelong head to the Gabba to take on the Brisbane Lions and need to win to keep its top-four aspirations alive. Richmond play St Kilda in a dead rubber but the Tigers will want to show it remains ahead of the Saints in the pecking order.